For deviding dry material such as gravel and sand. Stainless steel, chute width 1/2″, 12 holes, supplied complete with scoop and pans. Stainless steel, chute width 3/2″, 12 holes, supplied complete with scoop and pans. 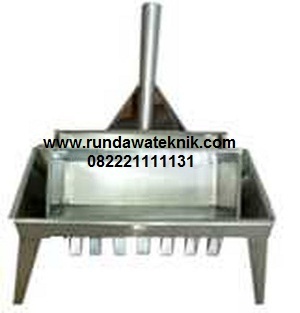 Stainless steel, chute width 1″, 12 holes, supplied complete with scoop and pans. Stainless steel, chute width 1-1/2″, 8 holes, supplied complete with scoop and pans. Stainless steel, chute width 2″, 8 holes, supplied complete with scoop and pans. Stainless steel, chute width 2-1/2″, 8 holes, supplied complete with scoop and pans. Stainless steel, chute width 3″, 8 holes, supplied complete with scoop and pans. 24 Jam Selama 7 Hari !! !